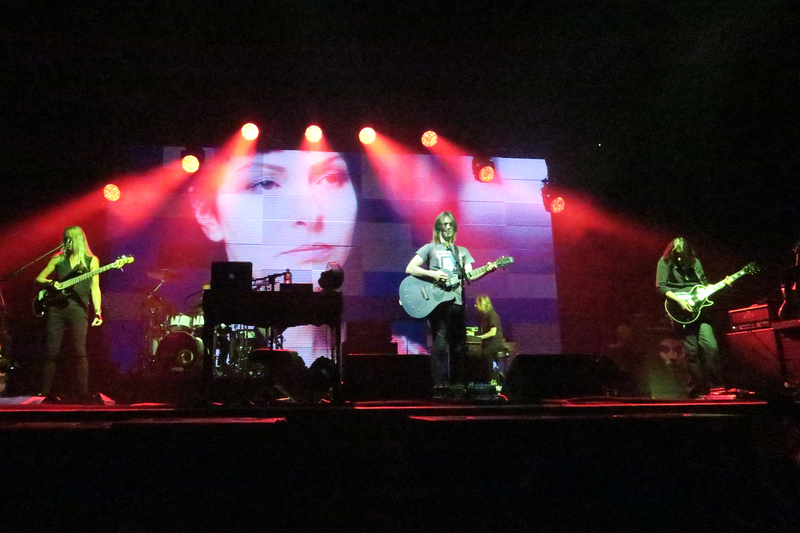 Steven Wilson was three songs into the set when a confession was made. More on that in a few moments, but first let’s mention the visual display that figured prominently in the gig: a series of photo collages and videos projected onto the back screen of the University of Calgary MacEwan Hall stage. These urban scenes of rejection and isolation contained monotonous, towered housing estates, with apartment lights blinking on, then off. Hints of playful, nostalgic school ground noises built up, leading into First Regrets, the opening number on Steven Wilson‘s 2015 album, Hand. Cannot. Erase. 3 Years Older and then the title track were played tightly, hitting the spot. Hauntingly beautiful music from an established leader in modern Progressive Rock. Perfect Life came next, with the recorded voice of Katherine Jenkins talking through the perspectives of a female character, who is the basis of this concept album. The song was inspired by the tragic story of Joyce Carol Vincent who was found dead in her London flat, three years after she had died, unknown to friends and family. A semi-documentary film, Dreams of a Life, directed by Carol Morley provides that sad narrative visually. Time for a pause for breath, a look around at the audience and Steven Wilson’s confession: “Miserable music makes me happy and happy music makes me feel…sad”. He confided that, from an early age, he felt melancholic music to be uplifting, cathartic… “I don’t do happy”. A gloomy cue indeed for the next song, Routine, a harrowing musical tale of domestic, female drudgery, accompanied by moving images of ironing, scrubbing, and cleaning. According to Steven Wilson’s manager, this was “the most depressing song he had ever heard”. Lazarus from the Porcupine Tree album Deadwing was played on Steven Wilson’s beautiful black acoustic guitar, a custom, signature edition from luthier company, Babicz (Note for guitar aficionados: this instrument includes a torque reducing split bridge and a six-point array of string fastenings across the soundboard). Steven Wilson introduced his band, which includes a couple of changes from the studio album to accommodate those musicians other projects this summer. Craig Blundell was on drums who, contrary to some misguided heckling from the audience, is a brilliant drummer from England. Also in for the North American tour was guitarist Dave Kilminster, who has been playing with Roger Waters for several years. Some soaring Pink Floyd-like guitar solos were on show as well as some superb, jazzy chops. Long established bandmate, Adam Holzman was on keyboards, playing some mean Moog solos and Nick Beggs (“Sir Nicholas Beggs”) was introduced “on general low-end throb”. 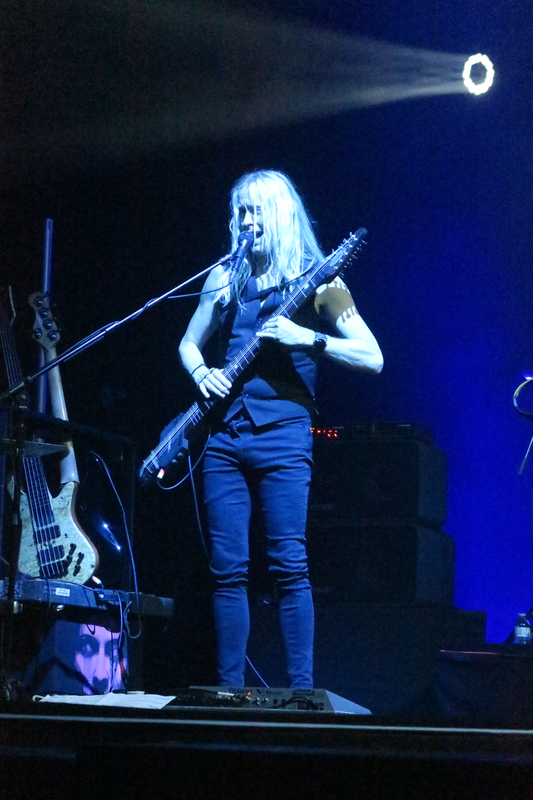 Not only bass but also on Chapman Stick, a two-handed fretboard tapping instrument. Steven Wilson revealed some of his musical influences as he recollected in conversation with the audience how he was raised as a teenager in the 1980’s but had gone back and found the music from the 1970’s. Shout outs went to XTC and Tears for Fears (a couple of my own favourites) as well as Kate Bush and American post-punk band, Swans who’s 1984 album Cop was cited by Wilson as “the most negative, raining blood music ever”. Two songs from Steven Wilson’s first solo album, Insurgentes were next, Harmony Korine (influenced by the Shoegaze genre from the likes of the Cocteau Twins and My Bloody Valentine) and the title track, before returning to Ancestral (fabulous lyric line there: “You can shut the door but you can’t ignore the crawl of your decline”) and Happy Returns with its beautiful melody connecting back into themes from Perfect Life, from this year’s tour album. A slender see-through curtain dropped down in front of the stage. Stark images of eyes, open mouths, clocks and more projected onto the silk-like fabric as the band continued playing The Watchmaker from behind. Melodic progressed to heavy duty Prog Rock, the curtain came down as the band finished off this masterful piece then into a couple of power plays: Sleep Together (from Fear of a Black Planet); and Sectarian (from Grace for Drowning). As all good things must come to an end, it was The Raven that Refused to Sing that finished the set and brought the seated audience up off their feet and towards the front of the stage. Hand cannot erase the pleasure of being in the audience for this multimedia, melancholic, musically gorgeous gig. 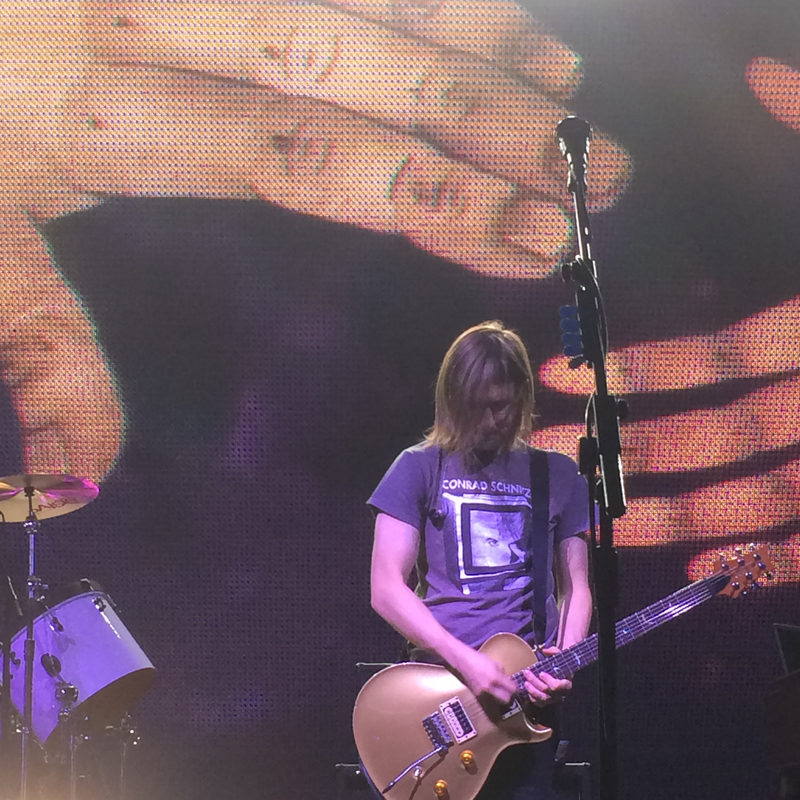 Come back to Calgary soon, Steven Wilson!